Our range of products include antispin model wire cable seals, pull tight cable seal, flex cable wire seal, breakaway wire cable seal and barlock wire cable seal short. 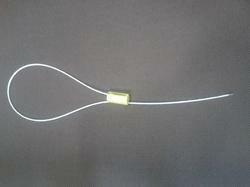 We are the leading manufacturer of Pull Tight Cable Seal has excellent temperature stability. We have Excellent readability even in artificial light. Applications: UVA trucks, containers, wire baskets, cars, shipping containers, swap bodies, tank containers, fuse boxes, tool boxes, motors, water pumps, transport containers, computer cases, chemical containers, Tanker Valves, Chemical Valves, Gas Valves, Ship Valves, Milk Tankers. 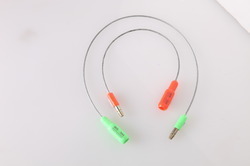 Benefits: Hex Wire Cable Seal has excellent temperature stability Individual attachment of the steel cable through Cable Pull Locking [CPL] allows precise application The steel rope diameter has very high tensile strength and is heavy Excellent readability even in artificial light Plastic protective layer as an indicator of tampering For sealing no tool is required. We are engaged into offering Flex Cable Wire Seal. Our offered seals are extensively used in reliable sealing applications of heavy goods. Our expert professionals make these exactly as per the customers’ detailed specifications. Moreover, they are known for their key properties such as sturdy design, smooth finish and superior performance. 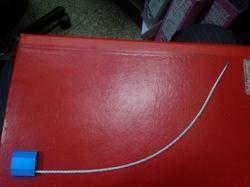 The Breakaway Wire Cable Seal is secured by turning the provided shear bolt until it securely locks the wire in place. The shaft of the shear bolt breaks when it has tightened the wire completely – and the seal can only be opened with a cable cutter. The Breakaway Wire Cable Seal is highly cost-effective compared to other cable seals made from premium quality materials. Be assured of better security with our innovative use of materials and industrial design. The Cable Breakaway Seals are etched with permanent laser marking. Laser marking offers the highest level of security as it cannot be removed or replaced. The exterior has been designed with a plastic molded pattern, which protects the marking during rough handling. The Cable Breakaway seals are highly suited to securing valuables for longer periods of time because of its simple yet very efficient locking. One end of the cable is permanently secured to the locking body. 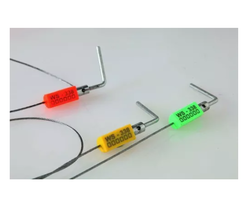 The Cable Breakaway seals are available in Green / Yellow / Orange colors which accommodate customized laser marking. These also make color-coding possible and ease identification from a distance. We are the leading manufacturer of Barlock Wire Cable Seal Short is very flexible steel cable seal developed for highest safety requirements and available in several colors. Features: Barlock Seal for all opening of about 10 mm and more Developed for highest safety requirements Very easy to handle Very flexible STEEL CABLE SEAL Standard execution consecutively numbered Produced from steel and covered by HDPE Polymer Body and Pin available in several colours Individual colour and Laser Marking is possible Marking of Logo and sequential number is done by Laser. Length can also be delivered according to individual requirements Ideal for sealing and securing of Trailers, Tankers, Bitumen Tankers, Milk Tankers, Petroleum & Oil Tankers, Trucks, Containers, Railcars, Wagons etc.